Head to your laundry room and try this 4-move workout to improve muscle tone without spending an extra penny on equipment. Kettlebell workouts are all the rage, but that doesn’t mean you need a kettlebell to get fit. 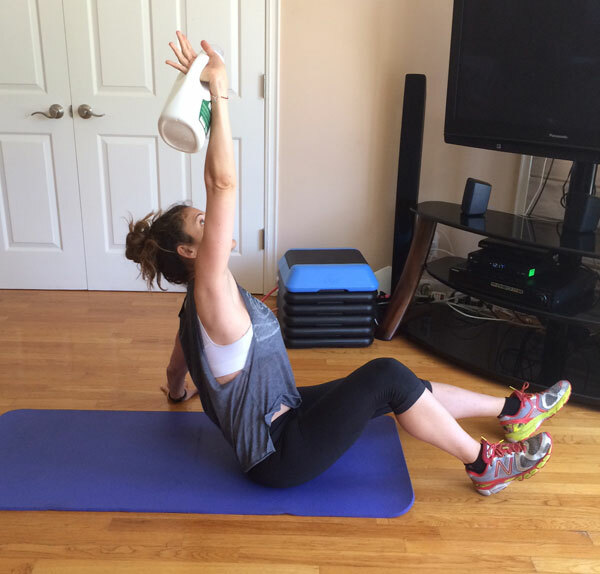 Chances are you have something at home that can serve as a kettlebell substitute: A jug of laundry detergent. Not only is it a substantial weight for exercising, but the handle makes it easy to grip. Perfect! Lay on the ground facing up. Hold the detergent in your right hand with your arm extended up above you. From this position, stand up keeping the jug exactly where it is. Do not use your free arm to help you get up. Lay back down and repeat. Do 10 reps on your right side, and then repeat on your left side. Take a quick break, and do another set. Turkish get-ups may seem simple, but they work your core, legs, glutes, and shoulders simultaneously for a full-body burn. Stand with your feet hip-width apart, and lower into a half-squat position. Holding the detergent with your right hand, swing it around the outside of your right leg and then between your legs and pass it to your left hand. 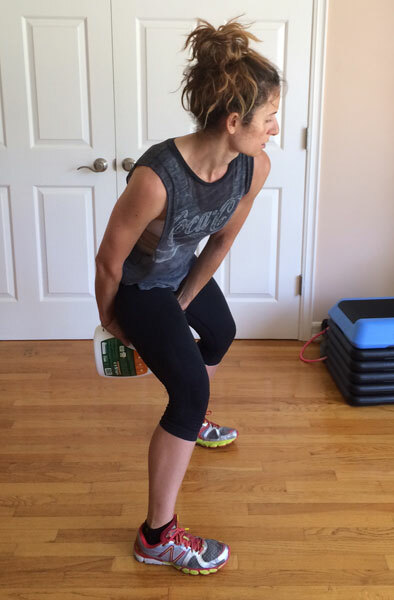 Staying in your half-squat position, pass the jug around your left leg and back between your legs. Continue making fluid figure eights through your legs. Do 3 sets of 15 figure eights. Remember to keep your back straight and your chest high! 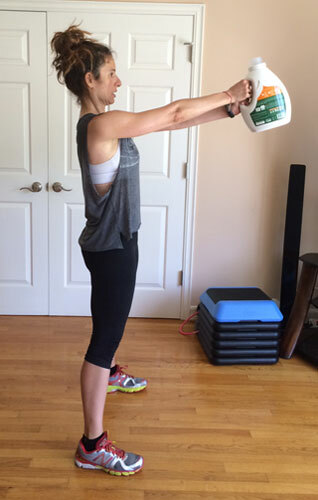 Stand with your feet shoulder-width apart, holding the detergent with both hands. Your arms should be extended straight down. Keep your chest high, back straight, and your knees slightly bent. From here, bring the jug up your torso until it reaches your chest. Your arms should be bent with your elbows out on either side of you. Hold for one count, and then lower the jug back down to starting position. Maintain control of the jug as you lower it back down. Don’t let gravity come into play! Do 3 rounds of 15 high pulls. Start in a squat position with your feet wider than shoulder width. Hold the detergent by the handle in both hands, extended down in front of you. From here, start to stand up while swinging the detergent up and keeping your arms straight. As you come to a complete standing position, the jug should reach chest height. In one fluid motion, lower back into a squat, bringing the jug back down to starting position. Remember to keep your arms and abs engaged to raise and lower the jug. Keep your back straight, chin up, and weight in your heels. Do 3 rounds of 15 swings. Looking for more ways to get a workout around the house? Try 4 Ways To Get Fit Using Just A Towel!